The cold, wet and windy days of winter always turn my thoughts to warmer climates and the summer bike tour. So where to go in 2016? Well as you can see from the photo above it looks like a river tour is on the cards! It was the suggestion of our Club Captain Tom Vaz, to have a dawdle down the Danube, Romania, Bulgaria and the Black Sea. But when I did a bit of initial research it didn’t look too promising. Yes it was nice and flat, but most of it was flat and very boring! And this was confirmed when I Googled the opinions and photos of cyclists who had done the ride. 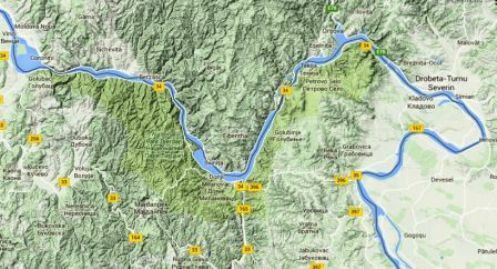 Now the Danube is over 2,800 km long so I reasoned that there must be some more interesting bits, so I clicked on Google’s Terrain Map and going back a bit upstream I found what looked like a very promising and scenic bit of the river. On the north side of the Danube are the Carpathian Mountains in Romania, and on the south in Serbia, the Balkan Mountains. This bit I found out, was the Iron Gate Gorge. All 100 km of it! 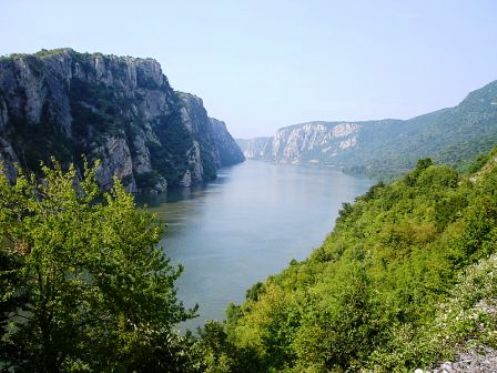 Over millenia, the Danube has carved its way through the mountains creating the longest gorge in Europe, with cliffs that rise up to 500 metres at the highest point. Actually it not “a” gorge, but is made up of 3 narrow gorges, 2 canyons and 3 additional valley sections. At the narrowest point the river is only 150 metres wide, and the force of water has cut away the river bed so that the depth of water is over 80 metres. There are roads on both sides of the gorge but all my research suggested that the one on the south side, in Serbia, had much less traffic than on the Romanian side. 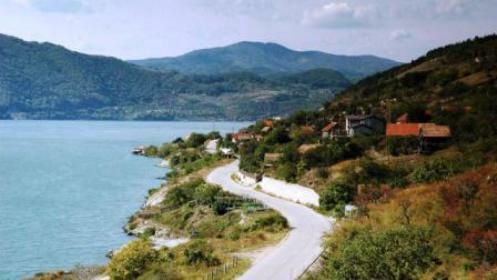 And from Belgrade, the capital of Serbia, to the western end of the Iron Gate Gorge was only about 100 km. And of course (very important) you can get a direct flight, with your bike, from London Heathrow to Belgrade! Budget flights are also available from Gatwick, however it appears that it is necessary to change flights at Munich. Is the extra hassle and stop over delay worth the cost saving? The gorge has a long and eventful history. For example the Danube was an important and much fought over border of the Roman Empire. The gorge still has important Roman fortifications, carvings in the cliffs, and the remains of Trajan’s Bridge, named after the Roman Emperor of that name. The barbarians on the Romanian side of the river were the Dacians. Hence the brand name of Romanian manufactured cars on sale at the Renault dealership on the A23 by Coulsdon Station. Both sides of the gorge are forested national parks with a great variety of wild life, hiking routes, mountain bike trails, and much more. Plus of course the river offers pleasure cruises, kayaking, swimming, or just lazing on the riverside beaches. And there is the rest of Serbia to explore! What more could you want? So a dawdle down the Danube seems like a good idea for this years summer cycling adventure. Now its back to the internet for some further research. Where to go, how to get there, what to do and where to stay? 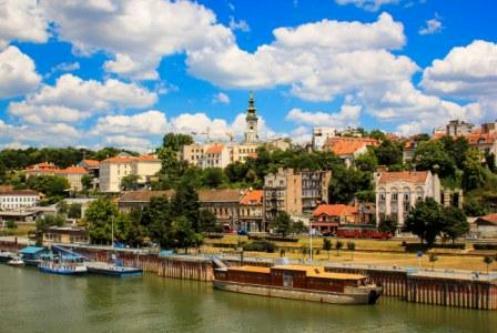 If you want to find out a bit more about Serbia and this beautiful area, click here . Scroll down as there are further links at the bottom of many of the web pages. P.S. The best laid plans of men! – Well it may be that these plans may have to be changed. Serbia is in the centre of the migrants’ route from Turkey to Germany and all parts west. If the Danube, EuroVelo Route 6, is part of their route then cycling against the throng might be impractical.